An eight-year-old American schoolboy’s irritation that Bermuda did not observe the Thanksgiving holiday — being celebrated in the US today [Nov. 24] — led to a kidnapping scare which made front page news around the world in 1934. Carroll Wainwright — whose stepfather was locally-based British shipping magnate Sir Hector MacNeal — ran away from home and then stowed away on a luxury liner to get back to the US after he was told there was no day off for Thanksgiving at his Bermuda school. Given his mother was also a granddaughter of billionaire American railroad developer and speculator Jay Gould, it was initially speculated the boy — who became known as “The Silk-Stockinged Stowaway” in the American press — had been kidnapped from his Bermuda home. Kidnappings for ransom were not uncommon during the Great Depression, the most famous case being the 1932 abduction — and subsequent killing — of the infant son of pioneering aviator Charles Lindbergh and Anne Morrow Lindbergh. The great Furness Withy ocean liner “Queen of Bermuda” made her maiden voyage to the island in 1933. 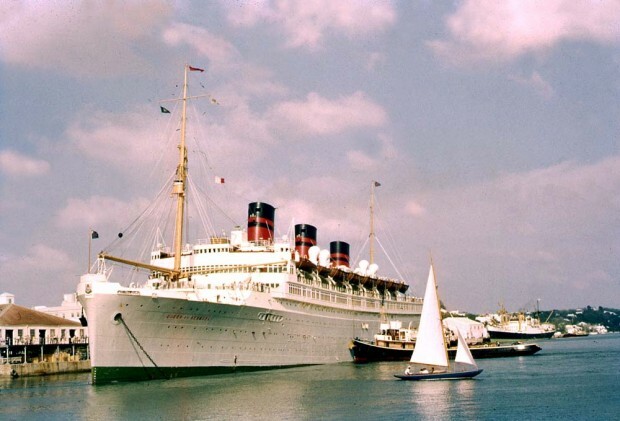 Upgraded and modernised in 1961, the ship wasn’t taken out of service until 1965. When the “Queen of Bermuda” berthed in New York, he boy shouted to his grandmother from the liner: “Hello, grandma, are you mad with me. The captain wired his distraught family in Bermuda to let them know he was safe.